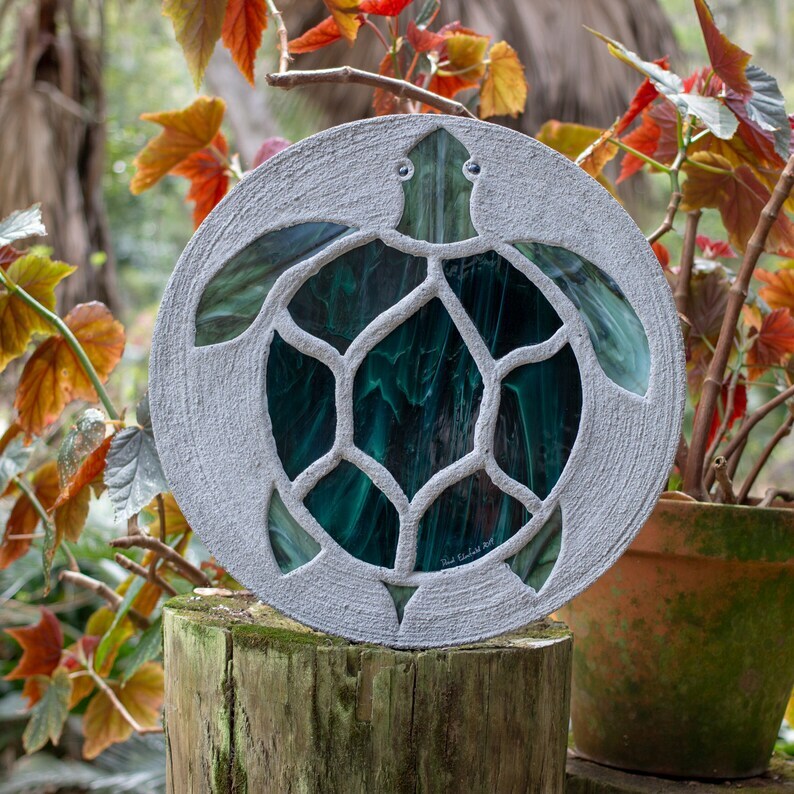 This pretty sea turtle's shell is made with dark green wispy stained glass. The flippers, head and tail are made of Spectrum "Rainforest" art glass. This is one of my oldest and most popular designs, first created in 1998. The mama turtle followed by several babies is a popular way to arrange these stepping stones, but they make a cute path by themselves or a pretty focal point for your garden. These are the same stepping stones that lead to the entrance of the Jekyll Island Sea Turtle Center here in Georgia. This is a testament to the durability of these stones as thousands of visitors have walked on the path since it was installed in 2007. ~ They are big and tough enough to walk on and will put a smile on your face for many years to come. ~ The original designs are hand cut from stained glass and embedded in high strength concrete featuring a textured, non slip surface. ~ The beauty of the glass, the unique textured concrete, and the depth and ridges formed by my process are difficult to capture with a photo, but when you hold one in your hands you will be impressed. ~ These stepping stones have become very popular here in the Southeast over the past 20 years, and their durability and practicality have been proven. Buy with confidence, I guarantee your satisfaction. You will find nothing else like them on the market, anywhere! Thank you for visiting, I appreciate your business! Great stepping stone! 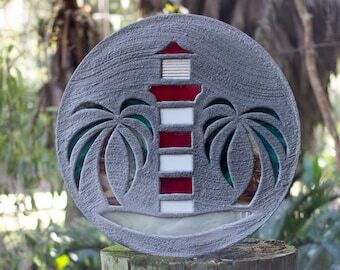 It made a wonderful gift.. just love it..
Our sea turtle stepping stone is even prettier than we imagined!!! This is beyond gorgeous! We will be using it to fill a round hole left when we removed a fountain. It will be the center piece of our walkway. Thank you! Absolutely gorgeous! My mother loves pelicans and this is going to make the perfect Christmas gift for her! Quick shipping and it arrived perfectly. Thank you so much!!! Your satisfaction is guaranteed. If you are not happy with your purchase for any reason it can be returned for a refund or replacement. UPS cannot deliver to PO Boxes. Please have your order shipped to a street address. We ship via UPS Ground to deliver our stepping stones to the Lower 48 United States. We can ship to Alaska and Hawaii but the cost of shipping will be considerably higher because these stepping stones are heavy. We package the stepping stones so that damage is extremely rare, but if a shipment is damaged let us know right away and it will be replaced at no cost to you. We have a lot of shipping experience so be assured that your stepping stone will arrive safely.